Taylor's Sweet Little Art and Nerd Site: Pin-up of the day- Bib Fortuna! Pin-up of the day- Bib Fortuna! I'm taking a little break in the Masters of the Universe sketch cards to do some pre- Fan Days Convention art work. Today's piece is Bib Fortuna! So here's the low down. Bib is a Twi'lek from Ryloth. He is the majordomo to Jabba the Hutt. He makes appearances in the Star Wars movies, "The Phantom Menace" and "Return of the Jedi". 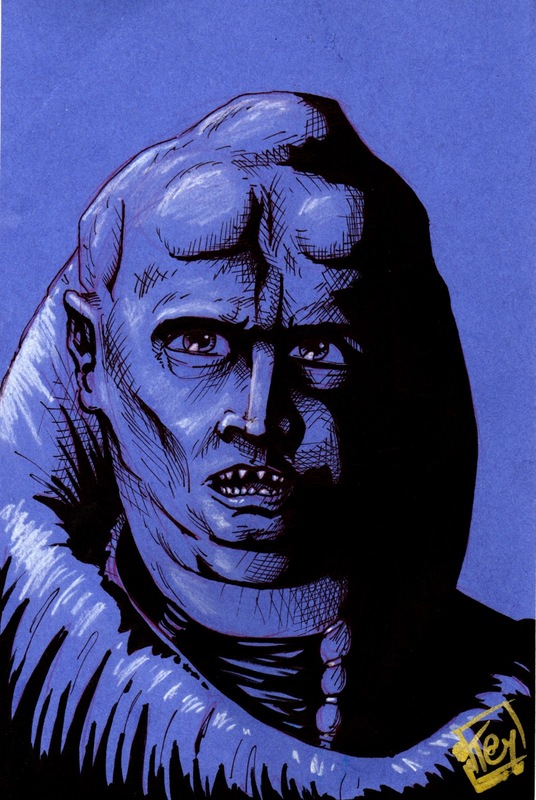 In the expanded universe, Bib Fortuna was kicked out of the Twi'lek society for exporting a weak spice called Ryll. From there, he had various jobs smuggling spice before he landed a job with Jabba the Hutt. In the service of Jabba, Bib would prey on other members of his society, forcing some into slavery in the palace. There is a lot more info on wookiepedia if you want to read up on Bib Fortuna. There is a great short story called, "Best Birthday Ever" in the fourth volume of Star Wars Tales of Bib "Oltxalt" Fortuna (as name appears on his license in the short story) procuring the Rancor! It's a funny story. As far as action figures, Bib Fortuna has been made several times throughout the continuing Star Wars action figure lines. I am waiting to see when they will put out a Fortuna in the Vintage Collection which would be nice. When that one comes out, I will try to procure a nice sample on card. My favorite Bib action Figure is the original Kenner Return of the Jedi vintage action figure. I had one of theses growing up. His head broke off, so I just wrapped his tentacles around his body. I then lost his staff, cloak, and body armor. I still held on to him. I just recently replaced my Bib Fortuna with a complete one that I got at the Dallas Vintage Toy Store. I will use my broken Bib for customizing. You can also see this art piece here. There's been an update to the store tabs on both Xenex the Bug Man, and this site. All of the print on demand issues, cafepress stores and commissions info will be under the new store tab on both this site and the Xenex the Bug Man site. Hopefully this page makes shopping a bit easier. Go and check it out! I just updated the Xenex the Bug Man website with rather grand news that the long awaited issue 4 is now up for order. It's a great looking comic book! Head on over to the Bug Man site and see what I'm talking about! Pin-Up of the Day- Boushh! Pin-Up of the Day- Admiral Ackbar! Taylor's Toy Tuesday's DIY Custom- Bib Fortuna! Furry Friday- The Wampa Ice Creature! Taylor's Toy Tuesday's DIY Custom- Mossman! Sketch Card of the Day- The Horde Trooper! Furry Friday - Logray vs. The Unstoppable Pencil! Sketch Card of the Day- Scorpia! Sketch Card of the Day- Gwildor!